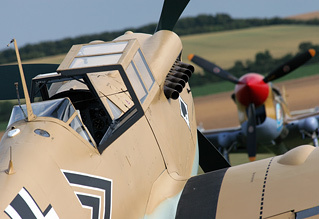 Though blessed with a truly world-class line-up of aircraft, Flying Legends 2011 will, sadly, be remembered chiefly for the loss of P-51D Mustang "Big Beautiful Doll", thankfully without loss of life. 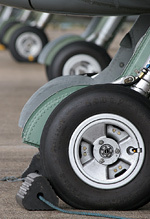 That incident was one of several at the show, both in the air and on the ground, which led to much discussion, and indeed record numbers of online users on UKAR's forums. We can't remember a show, at any venue, which sparked such debate or such contrasting opinions. Daniel Butcher spent the weekend in Cambridgeshire. Photos by the UK Airshow Review team. Perhaps I'm showing a little "rust", since the last time I attended a Duxford show was in 2006, but for my money Flying Legends is not a particularly pleasant airshow to attend. Your £32 on-the-day admission effectively buys you a place in a bunfight. Get there early, at the crack of dawn and get ready to battle for a piece of crowdline. Tie your chair to the fence, or be prepared to sit in it for the best part of six hours until flying starts, otherwise you're condemned to three hours or so of people's heads, shoulders, and occasionally, if they're using ladders or steps (despite PA announcements, the "no ladders" rule was not enforced by IWM staff, certainly at the M11 end of the airfield), their backs and bottoms. One of the big problems here is the layout of the crowdline - much of it is taken up by the trade stalls, and of course the flightline of display aircraft, meaning that a relatively small length of fence at either end is likely to offer the best, unhindered views - it's hard to see how this can be changed, so sadly the unpleasant experience is probably here to stay. The IWM are taking good money from thousands of people, yet the only staff witnessed on the crowdline were those trying to sell programmes. It was fellow enthusiasts who eventually made the stepladder brigade climb down. If you have rules, then please enforce them - it would surely be a far better policy for the IWM to look after the paying punters than to be chasing around the surrounding fields those who are watching from outside! The price of food at the venue was another sticking point; our party of two spent no less than £19 on grub on Saturday, none of it especially delectable, and £2 for a bottle of warm water is exorbitant. These days it's rare to find any airshow that won't rip you off for food, but even so, the prices at Duxford seemed to be inflated beyond the levels of shows like the notoriously expensive Air Tattoo. As for the flying displays, the line-up this year was, on paper, as good as anything Legends has ever had, though somehow it fell a little short of my expectations - as someone eloquently phrased it on our forums, the whole did not equal the sum of the parts. 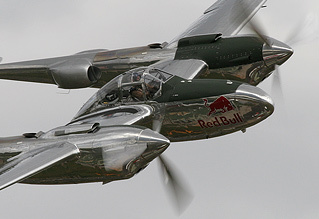 Red Bull's beautiful Lockheed P-38L/F-5G Lightning was the headline act; wonderful to see and deeply poignant too, with the type returning to Duxford skies for the first time since the great "Hoof" Proudfoot lost his life at the 1996 show in The Fighter Collection's example. The Flying Bulls also brought another of their fleet from Austria - a Chance-Vought Corsair, which, while being a welcome sight, wasn't flown with anything like the panache of the Forked-Tail Devil. The Spitfire tailchase, so often the signature of Legends, seemed a pale imitation of its former self with 'only' six aircraft taking part in a routine that was a way short of the standard of five or six years ago. Indeed they were rather outshone by the tailchases of both the Mustangs and P-40s, which were much more akin to what I remember, despite having only four and three aircraft respectively. 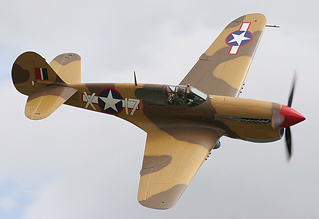 It was a real shame therefore that the P-40s - including the Fighter Collection's new desert schemed P-40F - didn't manage to get airborne on the Sunday; they were cancelled because of a blocked runway caused when Mikael Carlson's Fokker DR1 replica gently nosed-over on landing, causing minimal damage to the airframe. A sad end to Mikael's day, given that he'd just flown a majestic display of aerobatics, arguably the best flying of a DR1 since the Red Baron himself! Biplane fans were well catered-for, not least by the four-ship of Kestrel-powered interwar machines - a brace of Nimrods, a Demon and a Hind. 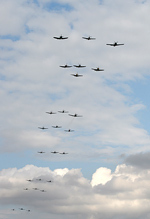 A majestic formation which deserved better than the grey skies which provided the backdrop for the majority of the displays across the two days. 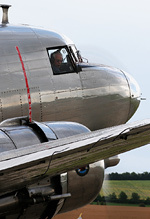 Larger aircraft were represented by Duxford-based B-17G "Sally B", the Battle of Britain Memorial Flight's Avro Lancaster, a pair of Dakotas (actually a C-53 and a C-47) from Norway and France respectively and Lufthansa's lovely Junkers Ju-52. 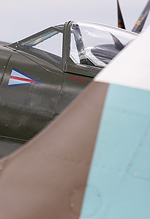 The Horsemen returned, bringing a couple of Stateside Mustangs "February" and "Fragile But Agile" with them, the latter familiar to Duxford audiences from its time at the IWM in the markings of "Twilight Tear". The routine of Ed Shipley and Dan Friedkin was all about absolutely precision formation flying. The two aircraft appeared stuck together for the entire routine (even on Sunday when they interrupted their display, having heard an erroneous radio message). The best solo display of the two days was almost certainly that of Meier Motors' wonderful F4U-5NL Corsair, painted in unusual, post-war matt black markings. A perfect example of how a warbird can be displayed for the crowd - plenty of power, not too many aerobatics, just lots of noise, "topsides" and spectacle. Despite the events of Sunday, the closing Balbo remains one of the most exciting elements of any airshow, anywhere in the world. Saturday's featured in total 28 aircraft, with two fewer participants on Sunday. The noise of all those glorious vintage machines passing by in close formation will never become tiresome. But, as alluded to above, this was far from a smooth, problem-free Legends. Sunday was marred by a number of incidents, aside from the accidental coming together of one of the Skyraiders and "Big Beautiful Doll", there was another very near miss right at the start of the display, when iconic Spitfire LF IXc MH434 on final approach was very nearly hit from behind by another of the French-based Skyraiders, who was subsequently told to abort the display. Another problem was when the Royal Navy Historic Flight Sea Fury ran in to display too soon, and had to pull out, as another two Sea Furies were still displaying. The Nieuport replica ground-looped without damage, and Spitfire Vb EP120 was reported to have swung significantly on take-off. That's not to suggest that any of the events were in any way connected, but it did have the feeling of 'one of those days' when incidents started mounting up. The actual collision between the Skyraider and "Big Beautiful Doll" then happened at the very end of the balbo finale, as that element of the formation made their break to land. Video shows that the Skyraider seemed to pull much tighter and more aggressively than the Mustang, and there was contact. The pilot of the larger aircraft managed to regain control, but Rob Davies was left with no option but to bail out of his stricken P-51, despite the relatively low altitude. It was much to everyone's relief that his 'chute opened, and soon it was reported that he was safely on the ground and walking around unaided. The Skyraider was skillfully flown back to the airfield, missing a large outer section of starboard wing, landing without further incident. Legends is famous and indeed loved for the furious pace - it is wonderful to see so much going on at once, although at some points it can become hard to follow it all with aircraft displays seemingly staggered across two or three axes meaning some things, like the Hawk 75, display so far away from the crowd as to be almost pointless - it completely passed me by on the Saturday. With aircraft constantly taking off, displaying and landing, the three hour slot is almost continuous. Myself and several others, while enjoying the spectacle, felt rather uneasy with aircraft displaying at low level and high speed in the same area of sky as other machines on final approach though. Being immersed in a multiple-aircraft display like the tailchase is one thing, but to have that going on while other aircraft are recovering created a few moments of genuine concern. This doesn't happen, to my knowledge, at any other airshow - and for good reason. There's certainly no need to end outright the non-stop pace of Legends, but perhaps given the lessons of 2011, things might be looked at a little more closely, especially the issue over landing aircraft while others are running in to display. No-one wants to see a sanitised, sterile Legends, but we all want the show to be as safe as possible. 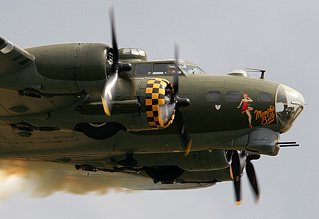 This was a Flying Legends which promised much more than it delivered. The customer experience inside the airfield really needs to be addressed as a matter of some urgency, before more people are forced to go looking for other vantage points in the adjacent fields, for reasons other than photographic ones.